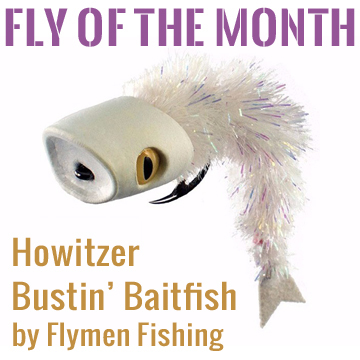 For August, we feature Flymen Fishing’s new Howitzer Bustin’ Baitfish tied using the new Howitzer foam baitfish popper head that imitates the head of a small minnow (or baitfish) splashing and sipping at the surface of the water. The Howitzer head is designed with a deep recess at the back so that an articulated body and tail of a minnow can be embedded seamlessly into the back of the head. As a result, the body of the minnow hangs down in the water (roughly at a 45-degree angle) and moves enticingly in a position that can be seen by predatory fish from a long distance and offers them an irresistible profile and an easy opportunity for a meal! To tie the Howitzer Bustin’ Baitfish, you combine the Howitzer popper head with Surface Seducer® Dragon Eyes™, Surface Seducer® Popper Hooks, and the Fish-Skull® Articulated Shank. Middle Body and hook: Marabou, White with several wraps of Palmer Chenille. Want to learn more about how to tie this fly? Read the Flymen blog, Inside Look: Designing the Surface Seducer Howitzer by Martin Bawden for a behind-the-scenes look at developing this new material, as well as videos demonstrating how to tie the Howitzer Bustin’ Baitfish. This entry was posted in Fly of the Month and tagged fly tying instructions, fly tying materials on July 28, 2017 by J Stockard. The Murray River is Australia’s longest—some 1500 miles. The Mitta Mitta, flowing out of the Great Dividing Ranges in Victoria is the Murray’s largest headwater tributary. Hydro schemes, gold mining, dairy farming and logging has long transformed the Mitta Mitta valley into what it is today. Although Australian anglers are quick to praise the introduction of brown and rainbow trout into the Victorian mountains in the 19th century, they are also quick to show complete disgust for the introduction of the European Blackberry, Rubus fruticosus. Blackberries were introduced into the Sydney region in New South Wales in 1830 by early settlers. However, in a fateful decision that continues to plague trout anglers well into the 21st century, in 1851 the Government Botanist in Victoria, Baron von Mueller, and the first Curator of the Gardens at Melbourne University, Alexander Elliot recommended blackberries be planted along stream banks to prevent erosion. It didn’t take long for everyone to realize how bad a decision that was. This entry was posted in Fly Fishing Life, Mike Cline, Bozeman MT and tagged Australian fly fishing, brown trout, fly fishing, rainbow trout, trout fishing on July 25, 2017 by Mike Cline. Designing effective flies, where does one start with this exactly? Creating something that will convince another living thing that our creations are good to eat, and that, it is food. Books? They’re great for research. Experienced friends? Yes! There you go! Hatch charts? Great source for what’s happening on your local stream or one you plan to visit and this gets us the closest to our beginning, the stream. This entry was posted in Fly Tying Tips & Tools, The Art of Fly Tying and tagged fly fishing, fly tying, fly tying advice, fly tying tips on July 20, 2017 by Jack Fields.